This series of light-up key chains is available in many designs and colors. The keyholders' body is made of plastic with light button in it. Power provided by two LR1130 batteries. Pressing the keyring body, light will be turned on or off immediately. Approx. size (exclude the key ring): W40 x D11 x H43 (mm). Emit a beam of durable red light. Minimum order quantity is 1350 pieces (can be mixtured with different styles as colors and designs shown as screen shot). Reommend for children 3 years up. Each keyring raped in a plastic bag. 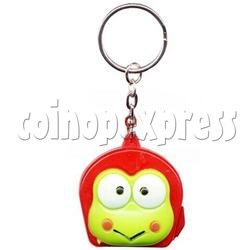 150pcs of keyrings packed in an inner carton, gross weight: 2.5 kgs, carton size: W32 x D23 x H18(cm). 450pcs of keyrings put into an outer carton, carton size: W440 x D360 x H55 mm, total 3 cartons for 1350 pieces order.